This side is rich in ancient and picturesque villages and it’s ideal for people who wish to combine relax, nature and , cultural activities. In the town of Mandello del Lario a stop is recommended to visit two religious monuments: the sanctuary of the Madonna del Fiume and the Church of San Giorgio. The first was built between 1624 and 1627.
even possibly a Templar monk or even possibly a Templar monk. Also in Mandello is the museum of Moto Guzzi that tells the story of the motorbike from Lake Como. The itinerary continues to Lierna with the small medieval hamlet of Castello whose fortified structure is built to protect the small peninsula overhanging the water. 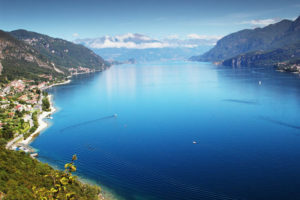 Lierna, with its beaches, the “Riva Bianca” and the “Riva Nera”, is also one of the most visited and popular summer holiday resorts on the whole lake. On the opposite shore of the lake there is the Costieradegli Olivi. Malgrate, just in front of Lecco , welcomes the visitor with a romantic pier and a number of bars and restaurant where is possible to taste local food. The road follows on to the tunnel beyond Parè di Valmadrera. In this area there are quiet corners and many beaches visited by bathers in summer time. Onno, Vassena and Limonta are hamlets of Oliveto Lario, which takes its name from the cultivation of plants that produce tasty local green oil. This is a summary of the places and the most famous monuments. To discover the inner soul of the lake you can take part in one of our itineraries, events or courses in the area. Link a sezione discover .